My name is Caroline Desmond i am (24years old) but age doesn' t matter in a real relationship so i am comfortable with your age, I am from (Rwanda in East Africa) 5.3ft tall, fair in complexion, single (never married ) and presently i am residing here in Dakar Senegal as a result of the civil war that was fought in my country some years ago. My late father Dr. Philip Desmond was a politician and the managing director of a (Gold & Mine Industry) in Rwanda in East Africa before the rebels attacked our house one early morning and killed my father and mother in cold blood. I know that i should have waited for our relationship to last a while before i tell you all this secret, but because of my situation here in the camp, and i don' t want to die here, please understand me. Please do not be offended for this message that comes from me, its just that i don' t know what else to do, because my situation here as a refugee is giving me a great concern, therefore i will like you to consider my situation as an orphan, and be kind with me, as i am putting the whole of my trust on you without fear, though i don' t know who you are before, but i believe that you can not betray it at the end. I have contacted you because of my difficult situation here in this refugee camp, It' s just like one staying in the prison and i hope by Gods grace i will come out here soon. I don' t have any relatives now whom i can go to, all my relatives ran away in the middle of the war the only person i have now is the pastor ( Rev- Patric Devine ), who is the pastor of the ( CHRIST DE SAVIOR MISSION ), here in the camp he has been very nice to every body, but we are not leaving with him rather we are leaving in the hostel, which is divided into two sections, one for the male, and the other for the female. The Pastors Tel. number is ( +221- 777-303- 178 ), if you call and tell him that you want to speak with me ( Caroline ) he will send for me in the hostel. As a refugee here, i don' t have any right or privilege to anything be it phone or what ever, because it' s against their law. I have my late father' s statement of account and death certificate here with me, which i will send to you latter, because when he was alive he deposited some amount of money in a leading Foreign bank which he used my name as the next of kin, the total amount, is ($6.7 $6.7 Six Million Seven Hundred Thousand Us Dollars). So, i will like you to keep it to yourself and don' t tell it to anyone because i am afraid of loosing my life and the money if people gets to know about it. My favorite language is English and i speak French very fluently. Meanwhile i will like you to call me like i said i have a lot to tell you, the attached are my pictures. Have a nice day and think about me, awaiting to hear from you soonest. Thanks a lot for your response, I will also like to touch & see you face to face,please try to call me today by 14:00 GMT with the reverend phone number which I gave to you,I will be waiting for your call,I want to inform you that before i contacted you, I saw your profile that you matched mine and you are the type of man i am looking forward to spend the rest of my life with. I confide you dear that' s why i am giving you all this information. As i told you before,this camp is just like a prison and I pray always to move out from here as soon as possible.Please make sure that you contact the bank so that after the transfer you can send some money from that money for me to prepare my travel ling documents to meet with you in your country. The Name of the transfer officer is Mr .Nelson Smith . Dearest one, firstly i thank you for your response to my email. How is everything over there, i believe that you are in good health and that the atmosphere over there in your country is very nice today? Mine is a bit warm over here in Dakar Senegal. My name is Caroline Desmond i am (24 years old) but age doesn't matter in a real relationship so i am comfortable with your age, I am from (Rwanda in East Africa) 5.3ft tall, fair in complexion, single (never married ) and presently i am residing here in Dakar Senegal as a result of the civil war that was fought in my country some years ago. My late father Dr. Philip Desmond was a politician and the managing director of a (Gold & Mine Industry) in Rwanda in East Africa before the rebels attacked our house one early morning and killed my father and mother in cold blood. I know that i should have waited for our relationship to last a while before i tell you all this secret, but because of my situation here in the camp, and i don't want to die here, please understand me. Right now, as i am talking to you, i am the only person alive in my family, and I managed to make my way to a near by country (Senegal) where i am leaving now as a refugee under the care of a Reverend Pastor and i am using his computer to send these message to you now. Please do not be offended for this message that comes from me, its just that i don't know what else to do, because my situation here as a refugee is giving me a great concern, therefore i will like you to consider my situation as an orphan, and be kind with me, as i am putting the whole of my trust on you without fear, though i don't know who you are before, but i believe that you can not betray it at the end. I have contacted you because of my difficult situation here in this refugee camp, It's just like one staying in the prison and i hope by Gods grace i will come out here soon. I don't have any relatives now whom i can go to, all my relatives ran away in the middle of the war the only person i have now is the pastor ( Rev- Patric Devine), who is the pastor of the (CHRIST DE SAVIOR MISSION), here in the camp he has been very nice to every body, but we are not leaving with him rather we are leaving in the hostel, which is divided into two sections, one for the male, and the other for the female. The Pastors Tel. number is (+221- 777-303- 178), if you call and tell him that you want to speak with me (Caroline) he will send for me in the hostel. As a refugee here, i don't have any right or privilege to anything be it phone or what ever, because it's against their law. My love I want to go back to my studies because i only attended my first year before the tragic incident that lead to my being in this situation now took place. NOTE; Please listen to this (please it's a secret, even no one knows about it except the Reverend father that knows about it), I have my late father's statement of account and death certificate here with me, which i will send to you latter, because when he was alive he deposited some amount of money in a leading Foreign bank which he used my name as the next of kin, the total amount, is ($6.7 $6.7 Six Million Seven Hundred Thousand Us Dollars). So i will like you to help me transfer this money to your account and from it you can send some money for me to get my traveling documents and air ticket to come over to meet with you. I kept this secret to people in the camp here, the only person that knows about it, is the Reverend because he is like a father to me. So, i will like you to keep it to yourself and don't tell it to anyone because i am afraid of loosing my life and the money if people gets to know about it. Remember i am giving you all this information due to the trust i deposed on you. I like honest and understanding people, truthful and a man of vision, hardworking and GOD fearing people. My favorite language is English and i speak French very fluently. Meanwhile i will like you to call me like i said i have a lot to tell you, the attached are my pictures. Have a nice day and think about me, awaiting to hear from you soonest. My Love Darling. Thanks a lot for your response, I will also like to touch & see you face to face, please try to call me today by 14:00 GMT with the reverend phone number which I gave to you, I will be waiting for your call, I want to inform you that before i contacted you, I saw your profile that you matched mine and you are the type of man i am looking forward to spend the rest of my life with. Note: I am not going to give your love to another man you will satisfy me, needless of looking for another man. Please i have not told anyone except you about the existence of this money and i will like you to please keep it secret to other people because since it is (MONEY) all eyes will be on it. Contact them now on how to transfer the $6.7 (Six Million Seven Hundred Thousand US Dollars) deposited by my late father which i am the next of kin. Honestly I am happy that God has brought you to see me out from this execrable situation which am passing through and i promise to be kind and will equally need you in every area of my life Including investing this money since i am still too young to manage it. As i told you before, this camp is just like a prison and I pray always to move out from here as soon as possible.Please make sure that you contact the bank so that after the transfer you can send some money from that money for me to prepare my travel ling documents to meet with you in your country. Awaiting to hear from you soonest!. 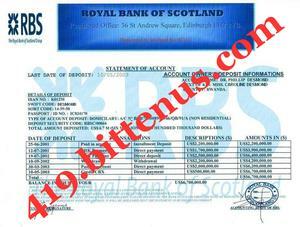 The Royal Bank of Scoatland plc, Registered in Scotland No. 90312. 1. A power of attorney and affidavit of oath permitting you to claim and transfer the funds to your bank account on her behalf. Note:This Power of attorney must be endorsed by a Senegalese resident lawyer (since the money is originated from Africa and the Girl is Currently residing in Senegal). 2. 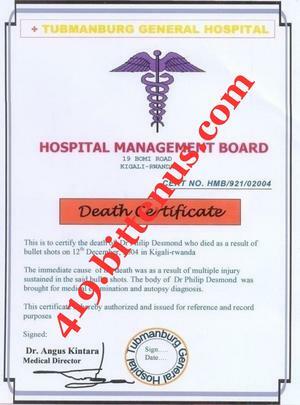 The death certificate of late Dr. Philip Desmond (Her deceased father) confirming the death. 3. A copy of Deposit Certificate of the account issued to Dr. Philip Desmond by our bank. Note that the above are compulsory, and are needed to protect our interest, yours, the next of kin after the claims. These shall also ensure that a smooth, quick and successful transfer of the fund will be make within 48 hours at reception of these documents. Therefore You have to present these documents to our bank to enable us wire the fund (US\$6,700,000.00) into your account. We promise to give our customers the best of our services. Should you have any question(s), please contact foreign transfer officer Mr. Nelson Smith on telephone number +447 031 860 566, +447 031 839 591, Fax +447 017 029 533. for more directives/clarifications. Hello Sweetheart, How are you today, Hope fine ? i am pleased with the way you are using your position to help me recover my inheritance which i was refused because of the law of Senegal. God will guide, protect and strength you and your family coming to the rescue an orphan. like me i will forever leave to remember you and your entered family. As i have earlier said, i have with me some document, all that we need is the Draft letter requested by the bank, the Power of Attorney and Affidavit of Oath which the bank said we must get it in Senegal because i am living in Senegal. My dear i find it difficult because it is not easy for me to get a lawyer who will help me because of my refugee situation but i have use the influence of the Rev father to get this good lawyer, he is a famous human right lawyer, he has help alto of refugee in the past and i am confident ours will not be a different case. He promise to help us but insist we must meet up with his strict request as that is the only way he can help a refugee in getting this legal documents. Please don't hesitate to do all he has said as he has warn me that on known account will he attend to us or less we meet with his law firm request. Address: 115 Leopold Seldar Senghor Airport Way -Dakar Senegal. Remember to let me know as soon as you contact him, I will love you to keep all these to yourself. Remember, I have confidence in you, and strong love for you, that it is only death that can take me away from you. I know that with time, when all these pains are over, that we will be happy together as we celebrate our future and forget about the pains I am going through at this moment. You already know that I have devoted my self to you for the rest of my life. I would be happy to read the reply you get from a lawyer. Do not forget me in your daily prayers. May God bless you for me, I remain forever yours. I am waiting to read your mail. Subject: DENNIS COIY CHAMBERS/FINDING FROM FEDERAL HIGH COURT OF SENEGAL. BARRISTER DENNIS COIY CHAMBERS OF ATTORNEY AND OATH ASSOCIATION. Sequel to the request on how to prepare a power of attorney and affidavit of oath for you and your partner. Your partner Miss. Caroline Desmond was in my office with Rev-Patric Devine to discuss about the issuing to you an authorization letter and affidavit of oath that will enable you to stand on her behalf to transfer her money from Royal Bank Of Scotland, to your account in your country or elsewhere. Prior to my inquires from the bank and high court here in Dakar Senegal, I was made to understand from the bank that there are four documents required by them before the transfer of the money to your account. 2. A copy of His Statement of account. including certificate of power of attorney and the affidavit of oath which will enable the Bank to deal with you on behalf of your partner. My Noble Law firm wish to bring to your notice that before we can proceed with this services, We will want you to forward to this law firm immediately with your full data details through E-mail address. (Nationality /Full Name,Date of birth,Place of birth /Address Of Living And Telephone Number/Occupation, As you want it to appear in the power of Attorney). In View of above and from my inquiries, it will cost the sum of $530 for authentication of the power of attorney $480 for swearing of the affidavit of oath at the federal high court here before it becomes valid $260 for notary stamping at the notary office (before it will go out from Senegal here) and my legal processing fee of $480 total of ($1,750.00 ONE THOUSAND SEVEN HUNDRED AND FIFTY DOLLARS ONLY) to get everything done. You are to transfer this money through Money Gram or western union money transfer With this information as follows. Phone: +221 778 043 531. Subject: Please see the copy of the document. Dearest Love, Glory be to Almighty God who make you to understand my condition and still focused to my aid and i pray to God you will never lack in your life. I only believed in you because Almighty God have a reason for me to know you and put you to help me that's why am happy now, before am afraid of people but since i find you i have recovered my confidence since life has taught me not only to be patience but to continue the fight for success irrespective of odds standing my way. I appreciate your effort towards helping me as i believe that you will keep on with your promise that you will help me after your requirement pending my arrival to meet with you to start a new life. See is not that i don't want to give you the document but i want to know what the bank will required from us before giving you the document and you have never ask me that before. Now we have come to one point despise that the other two document will cost money like this. We have contacted the lawyer about this and he said the money is not for him but for the high curt which he have to pay the money before they will issue him the document. Please never mind the amount as i promise you that you will never regret in helping me and none of your effort will go in vain. Send the money to the lawyer as you know that this document now is what hold the transfer. Waiting to hear the good news from you and ask the lawyer how possible to send him the money. Take good care and have a lovely day with lots of love. I am pleased to inform you about my success in getting those funds transferred under the cooperation of a new partner from Paraguay I am currently in the Paraguay for my studies here in the Paraguay meanwhile, I will not forget your past efforts and attempts to assist me in transferring funds that we raised this in some way. Now you need to contact the Rev.Father who used to be a good father to me when I was in Dakar, Senegal, his name is Rev Father patric devine and his email address is as follows (revpatric30devine@yahoo.com). and his number is (+221-77106 1524). i told him to send a certified bank check of $450.000.00 which I prepared and kept for your compensation for all efforts and attempts to assist me in this matter. I appreciate your efforts at that time very much. so feel free to contact the Rev Father and instruct him where to send you the money. Please let me know immediately you receive so we can share our joy after all the sufferings at that time. At this point, I'm very busy here because of my studies and SORM project and the investor has to hand, finally, remember that I had forwarded instruction to the Rev Father on your behalf to receive that money. So do not hesitate to contact him and he will send the amount to you without any delay. and please do not forget to inform me as soon as the money received. Take care and God bless you and goodbye for now. Am Rev Father Patric devine the coordinator and controller of the Refugee camp here in Senegal. Actually Miss Caroline Desmond has left to Paraguay and she left me a check of $450.000.00 us Dollars with the bearers name. So therefore to be sure that the check belongs to you, kindly send me your full name and contact address so that after confirmation, i will send you the Cheque through DHL POST. Subject: RESPOND FROM THE DHL OFFICE TODAY . May the blessing of God bring joy into your life. Good Day to you, may the peace of our lord Jesus Christ be with you My Son, I went to DHL World Wide Agent Office this morning after received your mail in other to send your belongings to you and they said the cost of sending the Cheque from Senegal to your Country ( �) Is 155 dollars before they will allow me to send the bank draft, My Son i want you to send the sum of 155 dollars Today, with my name and information's below Today through Western Union Money Transfer so that i can go back and send the CHEQUE of ($450 000.00) that is written and duelly signed in your name to you. After you send the money to me try to contact me on phone or email with the informations which i will used to collect the money so that i will tell my secretary to go and collect the money today, before going back to the DHL office today to send you the Bank draft.So you have to call me back immediately you received this email. Thank you,and remain blessed in the lord..